Budapest, a world capital of masterful shoemaking, remains home to cobblers who may well be Europe’s very finest. Approximately 25 masters of their craft are responsible for producing Heinrich Dinkelacker shoes in one of the city’s oldest factories. They work without assembly lines or pressures to churn out massive quantities at a quick pace, creating gorgeous footwear in a way that has nearly gone forgotten in the 21st century. Each of these experts has specialised in two to three work steps over which they retain a particular level of mastery. Around one pair of premium shoes is made per employee per day. It takes around 300 work steps to complete each pair of perfectly handcrafted footwear, from cutting the leather through to topping off the upper with a beautiful finish. The way a premium shoe fits depends in large part on the last over which the upper has been ‘pulled’. Although the last is of crucial importance, though, it is not part of the finished shoe. It is removed prior to the final production process so that it can be used to shape the next pair of shoes, and so on. While other manufacturers require a mere 45 minutes to assemble their industrially manufactured shoes around a last, our shoes remain on the last forms for up to six days. This ultimately lends our models their lasting fidelity to fit, which shoe lovers treasure in our footwear. There are as many different types of feet as there are people in this world. A variety of lasts need to be available to create shoes that will perfectly grip the instep and heel and provide wearing comfort, regardless of the wearer’s foot size and shape. Dinkelacker has created around 15 last forms so far, from the classic ‘Rio’ for Budapesters, which has been used for over 60 years, through to the ‘Luzern’, which is used for modern, comparatively narrower cuts. Only the best leathers from renowned tanneries around the globe suffice for the premium production processes in the Heinrich Dinkelacker shoe factory. These include Horween, Weinheimer, Tanneries du Puy, Moretti & Russo di asandrino and Rendenbach. After carefully inspecting the leather, the shoemaker begins by cutting out the individual pieces of the shaft to form the upper using a special trimming knife, then pulls the shaft over the last by hand, a process known as ‘lasting’. The seam that connects the shaft, welt and outsole is decisive in determining a shoe’s durability. That is why, in keeping with old cobbling tradition, Dinkelacker has these seams stitched by hand. We are particularly proud of our hand-stitched braided welts, which our cobblers make by braiding two strips of leather between each stitch. This is a luxurious handcrafted detail that relies on a high level of expertise, one which hardly any shoe brand provides. When it comes to traditional handcrafted production methods, shoe experts know that there are essentially two options: combining the sole and shaft with either sewn-welting or double-stitching. Sewn-welted models are distinguished by a narrow, elegant heel. During this production process, the front of the shoe’s heel is stitched from the inside out, and the part of the shoe that cups the wearer’s heel is nailed into place. Meanwhile, double-stitched models are striking and athletic. A welt seam is threaded along the soles of these shoes. Subtypes of this production method include models with triple-stitched stoles, braided welts with leather strips or woven welts with two strips of braided thread between each stitch of the welt and double seams. Ultimately, both types of production methods yield equally comfortable and long-lasting footwear. 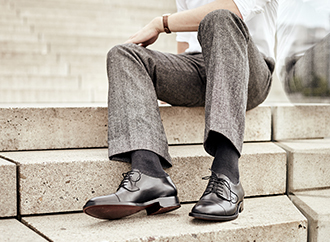 Dinkelacker men’s shoes feature heels and soles made from oak pit tanned leather. The tradition Trier-based Rendenbach oak pit tannery numbers among exclusive providers of this high-quality, extremely durable type of sole leather. The well-kept secret behind this traditional tanning process is not only a time-consuming tanning process, but also the special way in which the hides are handled during this time. Oak pit tanning requires a wealth of experience, a good nose and a keen eye. Oak pit tanners consider a leather to have been masterfully tanned once it has spent a year in an oak pit — the finished product is of the highest quality, and incredibly soft. The multiple-award-winning Rendenbach sole leather tannery marks the outsole of Dinkelacker men’s shoe, attesting to their extraordinary quality. The trademark brass pins used for Heinrich Dinkelacker shoes as well as the massive metal sole protectors on the triple-sole models are both applied by hand. Not only are these details visually appealing, but they also protect our footwear from wear and tear. The Rio last is used to make models with masterfully crafted soles. Our unique triple sole with a meticulously driven-in set of six pins and brass tip is a one-of-a-kind masterpiece you can only get from Dinkelacker. These soles mark our shoes as top-notch works of craftsmanship, and are a gorgeous detail that wearers can show off when crossing their legs at a café table — when the metal on the sole catches the light, the wearer reveals himself to be a footwear connoisseur. The heels and soles on premium-quality men’s shoes serve a crucial function — to gently cushion blows when the foot rolls in motion. This is why the sole and heel are built in successive layers of leather, adhered to one another. Moreover, the shoemaker inserts a soft piece of cork to ensure a comfortable tread. This cork piece is typically enclosed between the midsole and outsole (depending on the sole design), and adapts to the physiognomy of the wearer’s foot over time. A steady hand, keen concentration and the utmost precision are required when the cobbler uses a razor-sharp knife to cut the excess leather from the front of the heel and smoothes it out with a shard of glass. The cobbler also works along the edge of the sole a final time with a blunt knife. After completing this ‘trimming’, the sole receives its finishing touch through ‘pumicing’ with fine sandpaper. Now, the sole is ready to be dyed and polished with wax colour. As a final step, the finish is applied to the outsole, and premium wax crème is rubbed into the shoe. A stamp on the sole brands the shoe as an authentic Dinkelacker model. Following the final quality assessment, each completed shoe is assigned an inspection number, which is marked on the inside of the shoe once it has been approved for sale. As a final touch, the master shoemaker vouches for the quality of each shoe by adding their signature to the inside.